Some believe The End is near—human interference is throwing our planet’s ecosystem off-balance, causing a chain of events that’s eventually going to snuff us out. Meanwhile, startling political developments point to big shifts in global power structures. And then there’s the end of painting. The end of punk. The end of DIY spaces. Of dive bars. The end of racism, sexism, gender. The end of White America. The end of an era. The end of the line, the end of the rainbow, the end of the tunnel. It’s often a cliché, but the idea of “The End” is powerful stuff, with a longstanding presence in art history. “Welcome to the End” is an intimate collection of objects addressing this timely concept. The Franklin’s compact wooden structure houses the works of twelve Chicago-area artists. 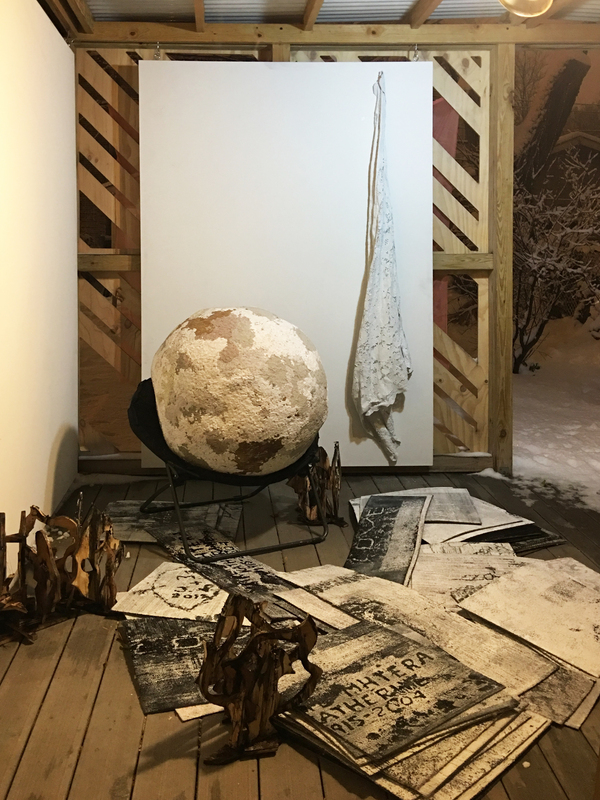 Nazafarin Lotfi’s meteorite-looking “Thingness,” a person-sized, stippled gray papier-mâché sphere sits ominously in a folding chair, recalling the planet’s last big extinction event. Abena Motaboli’s stained wood sculptures on the floor around it appear to have survived the impact explosion. 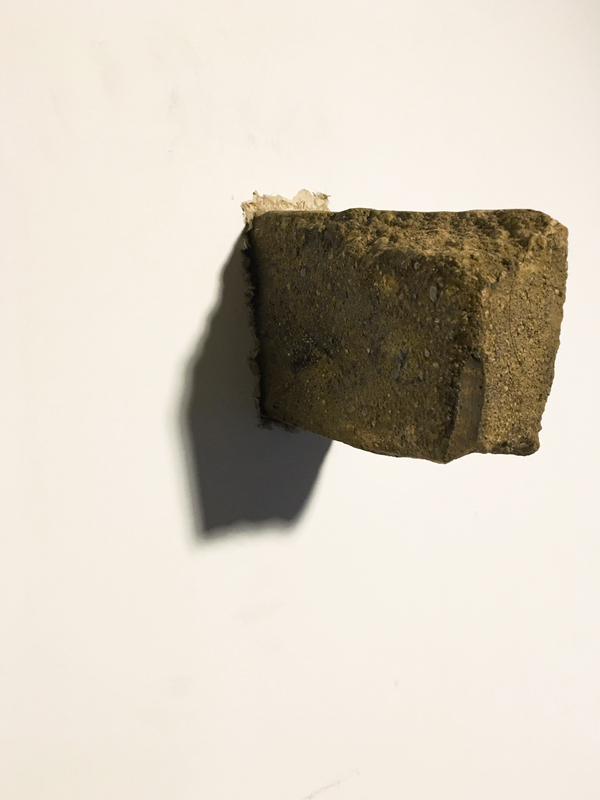 Jeffrey Michael Austin’s trail of dead flies and Scott Wolniak’s handmade brick, which appears to have been tomahawked into the drywall, also call to mind an end of days survival scenario. On the other hand, Spencer Hutshinson’s colorful flat works made mostly of torn posters reference the end of painting rather than the end of the world. Victoria Martinez’s casually colorful tapestry hanging on the exterior wall of the structure lightens the mood as well, but the overall feeling is somber. Expressive monochrome minimalism prevails. A wall is plastered with E. Aaron Ross’ oversized, inky black photocopies, piled on top of one another with manic urgency. Works by several artists intermingle in the chaos: screenprinted carpet pieces tucked under the meteorite’s chair reveal jumbled uppercase type, conveying a similar vague desperation; wilted white china and a plaster-soaked lace cloth hang in nooks and crannies like depressed ghosts.